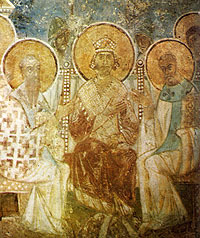 In January 2007, Prof. Olenka Z. Pevny reached out to those interested in the preservation of Ukraine's cultural heritage in a series of news briefs and letter writing campaigns requesting support in securing the on-going preservation of the twelfth-century Kyrylivs'ka tserkva (Church of St. Cyril of Alexandria) in Kyiv. This is her update on the status of the campaign. "St. Cyril teaches in the cathedral"
The Day, 20 December 2005. 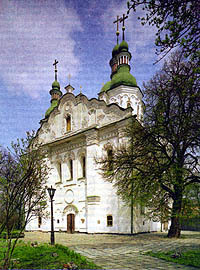 The Church of St. Cyril is a designated historical landmark. It is distinguished as the only well preserved twelfth-century monument in Ukraine and as one of two twelfth-century monuments to preserve extensive areas of original wall painting in all Rus' territories. A monumental princely foundation, the interior of the five-domed church contains an estimated 700-800 sq. meters of original frescoes including an unprecedented life cycle of St. Cyril of Alexandria. The National Preserve of the Sv. Sofiia in Kyiv oversees the preservation of the medieval monument. Recently proposed changes to the status of the monument would have severely restricted museum oversight and altered the conditions required for the on-going preservation of the unique architectural and fresco complex. As a result to the efforts of the directorship and staff of the National Preserve of the Sv. Sofiia in Kyiv and due to the overwhelming support received in the form of letters from all who responded to the developing crisis I am pleased to be able to report some positive developments. In a recent letter, Iryna Marholina, the Director for Education and Scholarly Affairs at the National Preserve of the Sv. Sofiia in Kyiv, informed me that she received an official letter from the Ministry of International Affairs of Ukraine with the proposition to nominate the Church of St. Cyril to UNESCO's World Heritage List. Should the Kyiv monument receive UNESCO status it would make it much more difficult for any changes to be made to its structure or decoration without international review. Iryna Marholina attributes this development to the letters written to the Ministry of International Affairs and to the Ukrainian chapter of UNESCO by the National Preserve, as well as to the mass mailing of supporting letters and e-mail received from concerned individuals and professional organizations. Together, Iryna Marholina and I also have nominated the Church of St. Cyril to the World Monument's Fund of 100 Endangered Monuments of World Cultural Significance. As we learn of the results of our efforts I will make them known. I would like to take this opportunity to sincerely thank everyone who took the time to do their part in securing the preservation of the Church of St. Cyril. Let us hope that together our efforts will result in a sound future for this unique monument of medieval culture in Ukraine. Olenka Z. Pevny is Assistant Professor of Art and Art History at University of Richmond.